Saute half the chopped garlic with some oil till fragrant, add in the dried shrimps, stir-fry. Add in the char siew and continue to stir-fry. Add in the 2.1/2 tsp light soya sauce and 2 tsp dark soya sauce. Toss in the long beans, give it a quick stir, dish out, set aside. In the same pan, saute the remaining chopped garlic with some oil, and add in the drained rice. 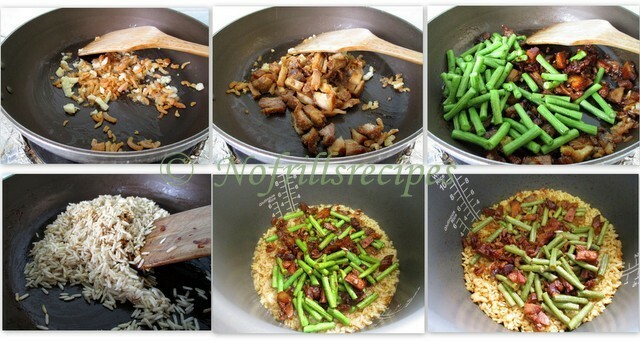 Add in the remaining light and dark soya sauce, stir-fry, mix well and transfer this 'fried rice' into a rice cooker. Add in the water and switch on the 'cook' mode. Add in the long beans mixture just before the rice is dried up. Continue cooking till the rice cooker automatically turn to 'keep warm' mode. Let it 'mature' for another 5 to 10 mins. Fluff up the rice, fine tune to taste, drizzle on some sesame oil and Shaoxing wine before serving.